HOUSTON, TEXAS (May 23, 2014) A historical event occurred at Houston’s BBVA Compass Stadium on Friday evening, May 23, 2014 and the 4,868 fans in attendance have been waiting for it since the Houston Dash became a member of the National Women’s Soccer League. In the 51st minute, Ella Masar scored the first home goal in Dash history, but it was not enough, as the Chicago Red Stars downed the Dash by the score of 3-1. The historical moment was the second for the 5-5 forward from Urbana, Illinois and was extra sweet as it came against her former team. Masar also scored the first ever goal in Dash history in their 3-2 win over the Boston Breakers on April 20, 2014. Unfortunately, historical moments do not singularly win games, and despite the Dash’s inspiring play, they could not overcome the offensive power of Chicago in dropping their sixth game of the season. Chicago was relentless with the ball; scoring their first goal on the 10th minute off a penalty kick by Vanessa DiBernardo. Dash goalkeeper Erin McLeod anticipated correctly, going to the right, but she was unable to reach it and keep it out of the goal. With the scored tied at one after Masar’s goal, the hopes of the Dash and their fans went south when Chicago scored two goals within eight minutes of each other. Three minutes after Masar’s historic goal, Red Stars midfielder Alyssa Mautz was all along on the left side of the box and drilled the ball past McLeod for their second score. The final Red Stars goal came in the 62nd minute off a DiBernardo free kick that was cut off by forward Jen Hoy and sent past McLeod. The game saw four yellow and two red cards; with Red Stars forward Melissa Tancredi and Dash head coach Randy Waldrum both being sent off. Of the four yellow cards issued in the game, the Dash was on the receiving end of a single warning. Masar, after scoring her historic goal, ran down the field and pulled “Brandi Chastian” in removing her shirt in joyous celebration. The Dash will next hit the road to take on the Washington Spirit at the Maryland SoccerPlex in Boyds, Maryland on Monday, May 26, 2014 with a 3 p.m. CDT start. HOUSTON, TEXAS (May 18, 2014) Jumping out to an early lead and holding on until the end, Matthew Stonie consumed 24 gyros to defeat No. 1 ranked Joey Chestnut and take home the title belt at the Niko Niko’s World Gyro Eating Championship at the Houston Greek Festival held at St. Basil the Great Greek Orthodox Church on Sunday, May 18, 2014. Stonie, the number two ranked eater in the world, was second to Chestnut in 2013, consuming 20 gyros for his second place finish. 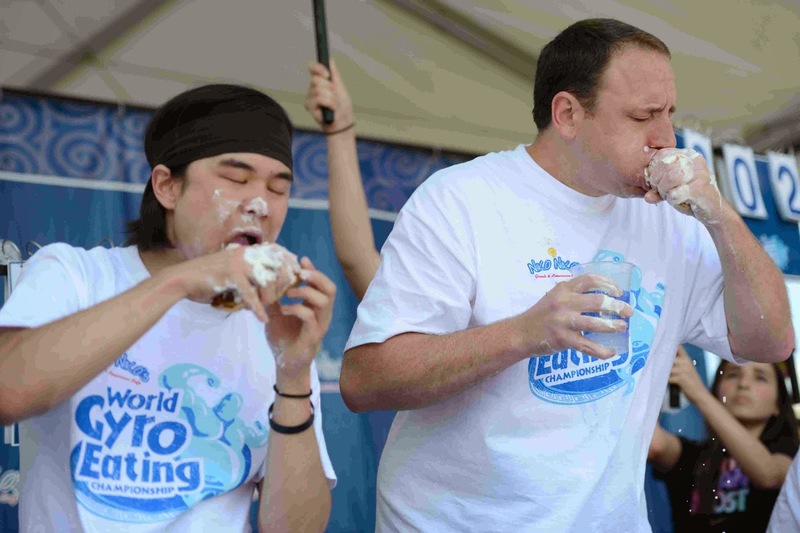 Chestnut, which goes by the nickname of “Jaws,” came into this year’s championship as the world record holder, consuming 22.25 gyros in 2013. It was a close match from the start, with Stonie establishing his lead from the first gyro and keeping a one to two gyro lead over Chestnut throughout the 10 minute contest. Jaws ate 21 gyros for his second place finish, slightly behind his 2013 performance. However, when it was all said, eaten and done; the day, the match, and the world champion performance belonged to Stonie. Placing third in the contest was Adrian Morgan with 12.5 gyros, followed by Miki Sudo with 11.5, Juan Rodriguez with 9.5 and Steve Hendry with eight. With the win, Stonie pocketed $2,500 and Chestnut took home $1,200. The event was hosted by Niko Niko’s Greek and American Café in Houston who invited 12 of the top eaters to compete for the title belt. Megatoad will next compete in the Pepperoni Roll Eating World Championships at the West Virginia Three Rivers Festival. Following that, Stonie and Chestnut will face some of the top eaters in the world at the Nathan’s Famous International Hot Dog Eating Championship on July 4 in New York City. 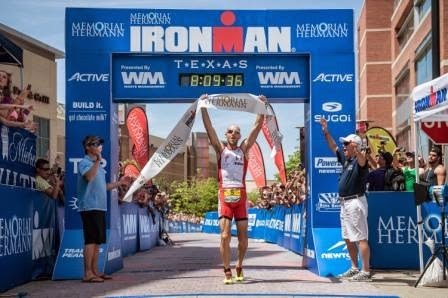 THE WOODLANDS, TEXAS (May 17, 2014) Australia’s Bevan Docherty and Austin’s Kelly Williamson took top honors in the professional division of the Memorial Hermann Ironman Texas Triathlon in the Houston suburb of The Woodlands on Saturday, May 17, 2014. Docherty, the two-time Olympian, took his title with the combined time of 8:09:37, five minutes ahead of second place finisher Matthew Russell. At the conclusion of the swim, Docherty was one minute and 20 second behind leader Brandon Marsh. At that time, American Jordan Rapp took and held the lead, completing the bike leg with a three minute, 30 second lead over Docherty. Rapp retained his lead until mile 10; when Docherty finally took the lead and held on to take the title. In the post race press conference, Docherty expressed what the win meant to him. "It's been an emotional year. I have to be honest, there were times I considered retiring from the sport. It wasn't easy today. You forget how hard these races are, but it's the biggest high of your life when you win races like this." Following Docherty in the placing was second place Russell (8:14:53), Justin Daerr (3rd-8:17;29), Rapp (4th- 8:17:58) and Chris McDonald (5th-8:22:51). In the women’s division, Williamson took top honors with a combined time of 8:54:42. Leading after the swim with a lifetime best of 51 minutes, 49 seconds, with Germany’s Julia Gajer a mere 45 seconds behind. The German took the early lead and held onto it over the 112-mile course, with Williamson dropping to fifth place. Williamson was five minutes, 30 seconds behind the leaders at mile eight of the run and quickly went to work to reduce the deficit. 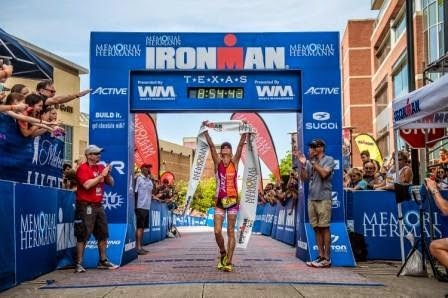 Despite having leg surgery a year ago, she took the lead at mile 16 and held on to win the title. Williamson run time of two hours, 54 minutes erased any doubts in her mind that she has recovered from the surgery. She stated in her post-race press conference about her doubts. "It (the surgery) led to a lot of doubts. I just had to keep digging at it. I knew I had it in me, but it wasn't until I got out there and started feeling strong throughout. It's tough to overcome struggles when your 12 years into your career." Williams was followed by second place by Gajer (9:00:52) with Amber Ferreira (9:11:48), Bree Wee (9:14:27), and Tamara Kozulina (9:15:19). PASADENA, TEXAS (May 16, 2014) When May comes around, that can only mean one thing. It is time for the Pasadena Strawberry Festival, beginning on May 16, 2014 and running through May 18, 2014 at the Pasadena Fairgrounds in the Houston suburb of Pasadena. In addition to tons of strawberries, music and carnival rides, the annual barbecue cook off is one of the main events that draws cooking teams from all over the Houston area and around the state of Texas. The Original Carribean Cookers, a state award winning cook team, will be competing at the Strawberry Festival for the 12th year in a row and they take every cooking competition as seriously as any professional athlete or team. The team started out as a group of friends and family who had a love of fellowship, music, and of course, barbecue. Carribean Cookers pull no punches with working to their desired result; winning whichever event they are currently competing and giving back to the community. With such a diverse team, one might think that the team has certain aspects that they emphasis. Team owner and head cook Byron Butts stressed that prior to the Friday night event. 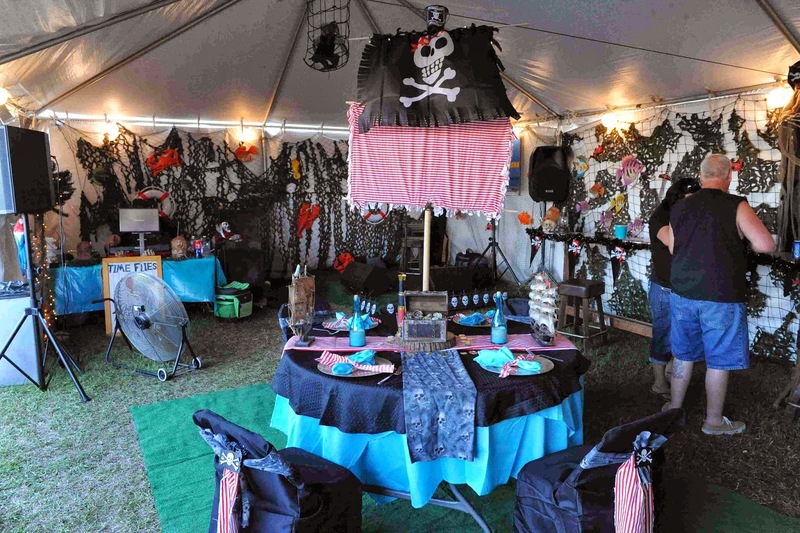 In fact, the Caribbean Cookers compete in a variety of events, including Cook’s Choice, Margaritas, Deserts, Best Port-A-Can, and of course, barbecue. They cook a variety of means, including ribs, brisket, fajitas, chicken and beans. Awards for showmanship and presentation are also contested. 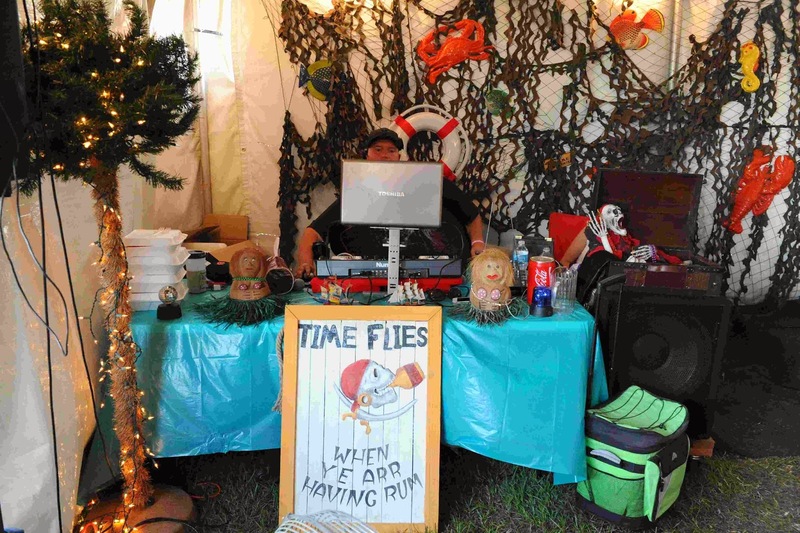 In addition to ample food and drink, Carribean Cookers provided entertainment for their sponsors, families and friends while they enjoy their culinary delights. Pasadena native Josh Norman will perform on Friday evening in the cook team’s compound. Norman will entertain those in attendance with country music favorites and original compositions. The Strawberry Festival will be the first event for 2014 and they have high hopes of continuing the success they have seen in past years. 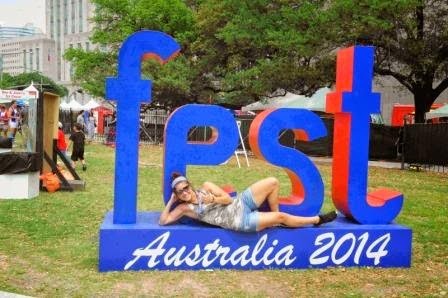 The festival will run from Friday, May 16 until Sunday, May 18, with awards presented on the final day. 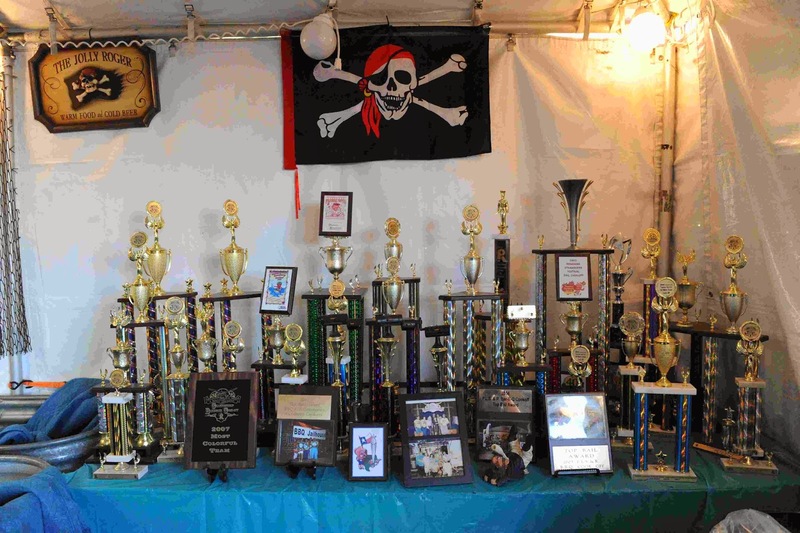 With all the enthusiasm, dedication and attention to detail seen inside their cook compound, there is no doubt Carribean Cookers will be taking home more awards to add to their already full trophy case. SUGAR LAND, TEXAS (May 10, 2014) The 7,701 fans in attendance at Constellation Field in Sugar Land, Texas on Saturday, May 10, 2014 were witness to the professional baseball debut of former NBA All Star Tracy McGrady for the Sugar Land Skeeters, and judging from the cheers coming from the stands, they were not disappointed. The former Houston Rocket and NBA Most Improved Player in 2001, T-Mac took the mound for the first time in 18 years, facing the Somerset Patriots in the fifth game of their current six game series. The 8-8, 210 pound McGrady lasted 1.2 innings, faced nine batters and threw 35 pitches. He started off slow in the first inning, facing six batters while throwing 23 pitches; 10 of them for strikes. In the second inning, he faced three batters and tallied eight strikes in 12 pitches before being relieved by right handed pitcher Clint Everts. In his professional debut, he threw a total of 18 strikes and 17 balls in giving up two hits on two runs. In addition, he walked two batters and gave up a single home run with no strikeouts. McGrady and the Skeeters will continue their current home stand on Sunday, May 11, 2014 with a 2:05 p.m. first pitch. 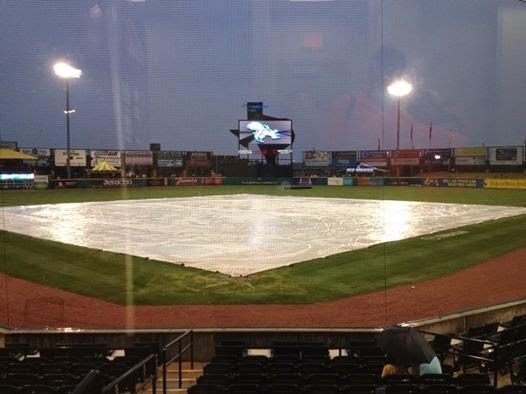 SUGAR LAND, TEXAS (May 9, 2014) With severe showers advancing through the Houston metropolitan area and after a two-hour rain delay, the Sugar Land Skeeters were unable to overcome a three-run Somerset assault in the first inning and dropped a 4-0 decision to the Patriots on Friday evening, May 9, 2014. The 6,656 fans in attendance at Constellation Field saw the Skeeters get on base five times but fail to get any runners past second base. Sugar Land starting pitcher David Pauley lasted six innings; giving up four hits and three runs, all of them earned, along with striking out five and walking four in the loss. Right handed pitcher Jared Wells pitching one inning in relief, gave up two hits and a single run to close out the game. Shortstop Dominic Ramos continued his success at the plate, hitting .385 in nine games while Wells gave up his first run of the season pitching in relief. 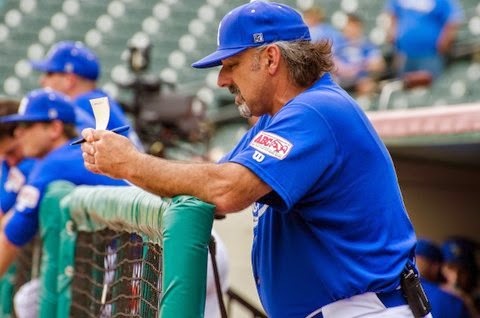 The Skeeters will continue their home stand on Saturday, May 10, 2014 when they again face the Patriots in the fourth game of their six game series with a 6:05 p.m. first pitch. Those in attendance on Saturday evening will see the professional baseball debut of former NBA All-Star and Houston Rocket Tracy McGrady, who will take to the mound for the Skeeters. McGrady will be facing Somerset LHP Matt Zielinski, who is 1-0 in 2014 with a 0.96 ERA. The Skeeters are currently 6-8 for the season and 3-5 at home. Somerset raised its record after Friday evening game to 9-5 on the season. through the first 12 games of the 2014 season. SUGAR LAND, TEXAS (May 7, 2014) With the score tied at five going into extra innings, the Sugar Land Skeeters could not overcome the two-run tenth innings of the Somerset Patriots and fell to their Atlantic League rival by the score of 7-5 at Constellation Field in the Houston suburb of Sugar Land on Wednesday afternoon, May 7, 2014. The Skeeters got on the scoreboard in the first inning when center fielder Ryan Langerhans scored third base on a single by designated hitter Nick Stavinoha. The Patriots erupted for three runs in the third inning and added a single run in the fifth inning and extended their lead to 4-1 before the Skeeters came powering back in the bottom of the inning. Sugar Land tallied three hits in the fifth inning to even the score at four and took a single run lead in the sixth inning off an RBI double by left fielder Neil Medchill to score second baseman Brandon Wood from second. Somerset tied the score in the seventh inning; with the tie forcing both teams into extra innings. The Patriots quickly scored two runs in the top of the tenth inning to secure the win. Langerhans connected for two runs and two hits while Rusty Ryal, connecting for his first home run of the season in the fifth inning and added three RBI to his season total of four. Brian Kozlowski, pitching 1.1 innings in relief, received the loss for the Skeeters by giving up the two runs in the tenth innings to Somerset. With the loss, the Skeeters fell to 6-6 for the season, while the Patriots raised their record to an identical 6-6. The two teams will again face off with an 11:05 a.m. start at Constellation Field on Thursday, May 8 in the third game of their current six-game series. BUDA, TEXAS (May 5, 2014) Change is in the air and on the web for the Austin X Games. Hayden Reed McCarter Oswalt is an avid sports fan, writer and photographer, and is currently a 7th grader at Dalmstrom Middle School in the Hays Consolidated Independent School District. Oswalt’s school is located Buda, Texas in the suburbs of Austin, Texas. Hayden is excited about the upcoming X Games in Austin, Texas. The goal of AustinXcite.com is to give the view of a teenager at the X Games from news, interviews and photography. With help from friends with over 75 years of experience to usher in the new era of journalist and photographer, the project is off to a great start. “This is my project with my dad, Ronald Oswalt. He is the CEO of SportsMarketingExperts.com,” Hayden Oswalt said. Sports Marketing Experts specializes in the creation, development and execution of innovative and highly impactful marketing programs for its clients. Other expertise includes creative, marketing and communication plans, production of major events, concerts and multi-cultural events, publicity and promotional events. “Immediately upon consulting with Hayden for his X Games-based website, we could see that interaction and multimedia were very important,” said Michael De Leon, Chief Technology Officer of Sports Marketing Experts and SME Design. Hayden Oswalt’s father, Ronald, sees this as a chance for his son to develop skills that will extend well beyond his school years. “Hayden was searching for a way to obtain extra credit for his web design class and this seemed like a chance for my son to get real world experience while gaining life-long skills in so many areas from marketing to journalism,” said Ronald Oswalt. SME Design has also implemented new features that will help Hayden and SME clients alike. The project of www.AustinXCite.com, will cover all aspects with the upcoming X Games in Austin fro a teenagers view of likes and dislikes. You can also find more information on Sports Marketing Experts at http://www.SportsMarketingExperts.com. FRISCO, TEXAS (May 6, 2014) On the eve of the Southland Conference Tournament, four members of the HBU softball team earned spots on the All-Conference teams. Sophomore Kirsten Schwirtlich and freshman Alyssa Burnett earned First Team honors, senior Lauren Schwirtlich was named Second Team All-Conference, and sophomore Shay Orsak earned a spot on the Third Team, the conference office announced Tuesday. 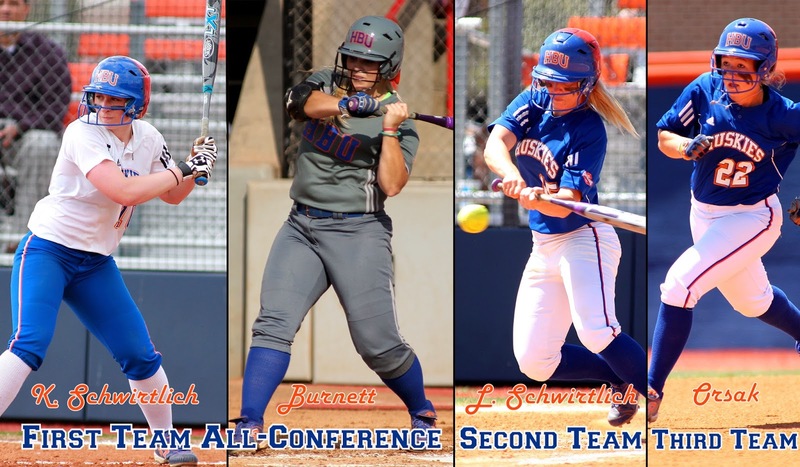 K. Schwirtlich, a native of Corpus Christi, Texas, makes her second appearance on the All-Conference Team, as she led the Southland with a .411 batting average, was sixth with 11 doubles, and seventh with nine home runs. She started the season with a hit in six of the first seven games and later had a 14-game hitting streak that spanned from March 29 through April 23. She set a new career high with two doubles against Texas Southern on Feb. 18. Schwirtlich had 11 two-hit games and five 3-hit contests. She recorded a season-high four RBI at UTSA on March 26. In conference play, Schwirtlich hit .449 with 35 hits, five doubles, three triples, four home runs, 17 RBI, and 20 runs scored. Burnett, who hails from Sugar Land, Texas, leads HBU’s freshmen with a .333 batting average. She has 37 hits, eight doubles, two triples, five home runs, 26 RBI, and 16 runs scored in 39 games. She had a career-high four-RBI game against Northwestern State on March 9. She had an eight-game hitting streak from March 13 through the 29th. Burnett has hit three game-winning home runs, one being in walk-off fashion. Her homer was the only run in a 1-0 win over Stephen F. Austin in game one on March 29, then she hit a walk-off three-run shot in game two to defeat the Ladyjacks, 8-5. She later hit a solo homer in the top of the eighth to help the Huskies defeat Houston for the first time in program history, 6-5, on April 23. Burnett is hitting .292 with 21 hits, seven doubles, two triples, three home runs, 17 RBI, and 10 runs scored in conference play. L. Schwirtlich, a native of Corpus Christi, Texas, also makes her second appearance on the All-Conference Team. Her .376 batting average is ranked 11th in the conference and her 64 hits is one shy of the conference leader. Schwirtlich started the season with a hit in 12 of the first 13 games. She set new career highs with four RBI at Prairie View on April 9 and four runs scored against Jackson State on Feb. 8. She has 17 two-hit games and five 3-hit contests. She hit three home runs on the season, all coming in a span of five days, as she hit one at Lamar on April 5, then hit homers in back-to-back games of a doubleheader at Prairie View A&M on April 9. In conference play, Schwirtlich is hitting .347 with 33 hits, six doubles, two triples, one home run, eight RBI, and 16 runs scored. Orsak, who hails from Katy, Texas, makes her first appearance on the All-Conference Team. She leads the Southland Conference with 22 doubles and is tied for the national lead with 0.47 doubles per game. She ranks ninth in the league with a .386 batting average. Orsak set new career highs with three doubles and four runs scored against Jackson State on Feb. 8, as she went 4-for-4 with four RBI in that game. She began the season on an 11-game hitting streak, spanning from Feb. 7 through the 21st. Orsak is currently on an eight-game hitting streak, which began on April 23. She has 16 two-hit games, one 3-hit contest, and two 4-hit games this season. In conference play, Orsak is hitting .360 with 32 hits, 12 doubles, two triples, one home run, 19 RBI, and 19 runs scored. Top-seed McNeese State won four of the six major awards, as Alanna DiVittorio – who has a .397 batting average – was named both Player and Hitter of the Year. Teammate Jamie Allred earned Pitcher of the Year honors, while Mike Smith was named Coach of the Year for the second-consecutive season. Nicholls’ Taylor Terrio was named Freshman of the Year, while Kylee Studioso of Central Arkansas earned Newcomer of the Year honors. The Southland Conference Tournament begins Thursday, May 8, as No. 5-seed HBU takes on No. 4-seed Stephen F. Austin at 11 am. PASADENA, TEXAS (May 6, 2014) Yes, you heard it right! The Pasadena Strawberry Festival along with Kroger is producing 2000 square feet of Strawberry Shortcake, the largest cake ever produced at the festival. 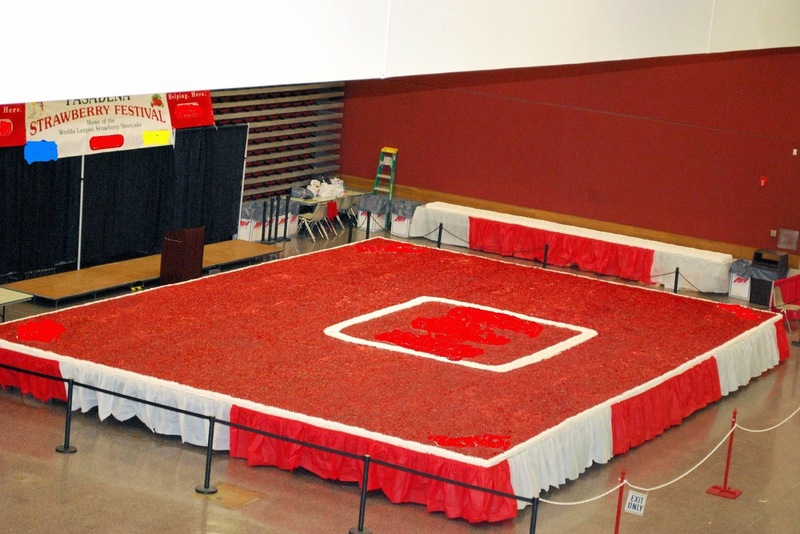 We are working with Guinness to hopefully break the set record for the Largest Strawberry Shortcake. So come out and watch history being made at the 41st Pasadena Strawberry Festival May 16 -18th on the Pasadena Fairgrounds 7902 Fairmont Pkwy. This year’s Festival offers much more in the way of entertainment, carnival rides, mud volleyball, warrior games, BBQ cook off, helicopter rides, children’s area, Swifty Swine pig races, American duck races, Fearless Flores Thrill Show, Tumbleweed Wild West show, Magic by Christopher Lyle, Wacky Chad, Washer pitching contest, wine tasting, beer tasting, fresh strawberries and much more. New event: Strawberry Warrior Games- played in the mud pits, tug a war, serve the ball to score points and throw the balls from court to court, timed event , winners packets, t-shirts, trophies, come out and give it a shot! Only taking 40 teams, so hurry!!! Tickets: $15 adults, children 5-12 & seniors 55 & over $5, children 0-4 free. Tickets available online www.strawberryfest.org or at the gate. HOUSTON, TEXAS (May 3, 2014) The Houston Dash, hoping to win their first game on the home turf of BBVA Compass Stadium in Houston, could not seem to get the ball into the goal and dropped a hard fought match by the score of 4-0 to the FC Kansas City on Saturday, May 3, 2014. The Blues jumped out to a 1-0 lead in the first half and added three goals in the second half to hand the Dash their third loss of the season. Kansas City’s first goal came in the 13th minute when forward Liz Bogus found the ball on a pass from forward Lauren Holliday; sneaking the ball pass Dash goalkeeper Erin McLeod for the goal. The Blues added their second goal three minutes into the second half when forward Amy Rodriguez broke through the Dash defensive line and powered a shot pass McLeod in the 48th minute. Their final two goals came in the 80th and 89th minute with midfielder Erika Tymrak and forward Frances Silva found the net. The Dash had to play the majority of the second half with only 10 players after defender Osinachi Ohale was red carded for bringing down Rodriguez on her approach to the goal. “Of the four games we played, I'm probably most disappointed in this one. They handled us pretty easy. I am disappointed in the effort. The effort has to be better when we get to Chicago." The Dash will face Chicago on May 11 with a 5 p.m. CDT start at Village of Lisle-Benedictine University Sport Complex in Lisle, Illinois. HOUSTON, TEXAS (May 2, 2014) The No. 13 Houston Cougars came back to score three runs late in the game, but it was not enough to overcome early runs by No. 18 Central Florida as they fell to the Knights by the score of 4-3 in front of 1,226 fans at Cougar Field in Houston, Texas on Friday, May 2, 2014. The Cougar pitchers had problems with the Knight’s hitting early in the game, giving up seven hits, which included six in the first four innings. Houston starting pitcher Aaron Garza opened with 6.2 innings on the mound, giving up four earned runs on six hits and facing 24 batters. The right handed pitcher receives the loss, dropping his season record to 6-4. Shortstop Frankie Ratcliff got the Cougars on the scoreboard in the fifth inning on a sacrifice grounder to score catcher Caleb Barker from third base. They tallied their second and third run in the seventh innings which saw eight Houston batters come to the plate and connect for five of their 10 hits. Houston came into the bottom of the ninth inning sending Ratcliff, first baseman Casey Grayson and designated hitter Justin Montemayor to the plate. Ratcliff quickly flied out to left field while Grayson grounded out to Knight second baseman Dylan Moore. Montemayor came to the plate with two outs and took the pitch count to before singling to right center field. Jacob Lueneburg was sent to the plate by manager Todd Whitting to pinch-hit for second baseman Josh Vidales. The Caledonia, Wisconsin native was appearing in his 28th game of the season and filed out to left field on a 1-1 pitch to close out the game. With the loss, the Cougars fell to 33-13 for the season. The Knights raised their record to 29-16. HOUSTON, TEXAS (May 2, 2014) The second weekend of the 2014 Houston International Festival kicks off on Saturday, May 3 with the culture and experiences of Australia in Sam Houston Park in downtown Houston. The nightcap of the day’s musical performances will be The Family Stone on the Bud Light World Stage beginning at 6:30 p.m.
Others performing on the Bud Light World Stage include American electric blues and soul blues singer and songwriter Trudy Lynn at 12:00 to 12:45 p.m. and The Allen Oldies Band from 1:00 p.m. to 2:00 p.m. The Allen Oldies Band plays true oldies music, including such long-a-go hits as “Wooly Bully” by Sam the Sham and the Pharaohs and “Snoopy vs. the Red Baron” by the Royal Guardsmen. They will be followed by Archie Bell and Charles Bradley. Bell, who is a former member of the American R&B group Archie Bell and the Drells, is from Houston and began singing in Houston area night clubs at age ten. Recently Bell has expanded his repertoire into blues, and country music genre. His performance will be enjoyed by old and young alike. Bradley will perform a variety of music, including American funk, soul and R&B. Bell will take to the stage at 2:30 p.m. and will perform until 3:30 p.m.
Bradley will close out the afternoon performance beginning at 4:15 p.m.
Other performances at other stages around the festival include the Mariachi and Ballet Forklorico Palmview at 11:15 a.m., Gypsy Dance Theater at 2:30 p.m., and the Ari-rang Korean Folk dance Group at 3:30 p.m. In addition, a large variety of vendors selling arts and crafts, food and drink and novelties will cater to those in attendance. The festival will conclude on Sunday, May 4, 2014. PASADENA, TEXAS (May 1, 2014) It’s that time of year again! Yep…Strawberry Festival time is once again upon us, so get your trailers, decorations and costumes together and help kick off the celebration as a participant in the 41th annual Pasadena Strawberry Festival Parade to be held Saturday, May 10th . This year’s theme “Wild about Strawberries”. It’s a crazy berry theme. Entries will be judged and awards will be presented at the Pasadena Strawberry Festival Opening Ceremonies at the Pasadena Convention Center at 5 pm on Friday, May 16th. There is no fee and now it is easier than ever to enter. Just visit the strawberry festival website at www.strawberryfest.org and click on events. There you can print out all the information, entry forms and see the Route map. Just fill out your parade entry forms and return by mail or fax to be included in the line-up. But hurry…the deadline to enter is May 5th. For more information on the Pasadena Strawberry Festival event and activities visit www.strawberryfest.org or call 281-991-9500.